So about that other gig I started. I am now teaching elementary school PE part time. It is not at my girls' school, so adding that to my plate three days a week has been interesting. But we're adjusting, and things are starting to fall into a routine. I do feel busier, but it is manageable. I'm even getting my workouts and runs in, although some days it definitely takes more planning than it used to. Speaking of runs. I had a little 26.2 adventure this past Saturday, running the Big Cottonwood Marathon. 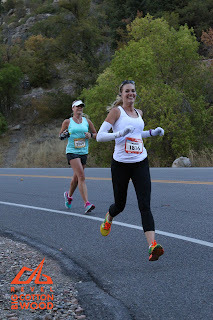 I felt pretty good mentally, but a week before the race my plantar fasciitis on my left foot really flared up and I could hardly put pressure on my foot. After a few days of icing, stretching and resting, I decided to try an oral steroid to see if that would get it to the point where I felt comfortable attempting a marathon; by Friday it felt quite a bit better. Little did I know that while it was helping my foot, it would completely destroy my stomach during the race. 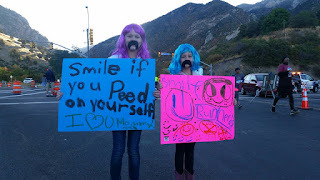 I felt really good the first eight miles and walked through the first few aid stations to drink water. At mile eight, I took some salt tablets to stay ahead of any dehydration issues. Within a few minutes of taking them, my stomach started cramping and feeling nauseous. I still tried to drink at least a little water at the aid stations, but my stomach didn't want anything in it and got progressively worse. I didn't even attempt any GU or more salt tabs. Within a few miles of where I would see my family for the first time, I tried a little Powerade but threw it right up. The other two times I tried Powerade later, I puked it right back up as well. About mile 18, I saw my family and broke down. I told Scott I felt so sick and didn't know what to do. But I had already told myself that if Grace would run with me for a bit, I would keep going. She quickly agreed, and we headed off on the out and back, which is about four miles. We walked whenever she needed a break, but she was a little trooper. There were times I knew she was struggling, but I could tell she was pushing herself to go further than her little body wanted to go. She would pick a spot and we would run until we got there before taking a walk break. I couldn't have made it through that stretch without her. When we got back to where Scott and Ellie were, I told them I would get myself to the finish and would see them there. I tried running as much as I could, but there was a lot of walking. At one point a pacer talked me into running with their group, so I did for a bit. But my stomach and body were fighting every step. By that point I was dehydrated, getting the chills and not sweating at all, so I just focused on moving as fast (or slow) as my body would let me. 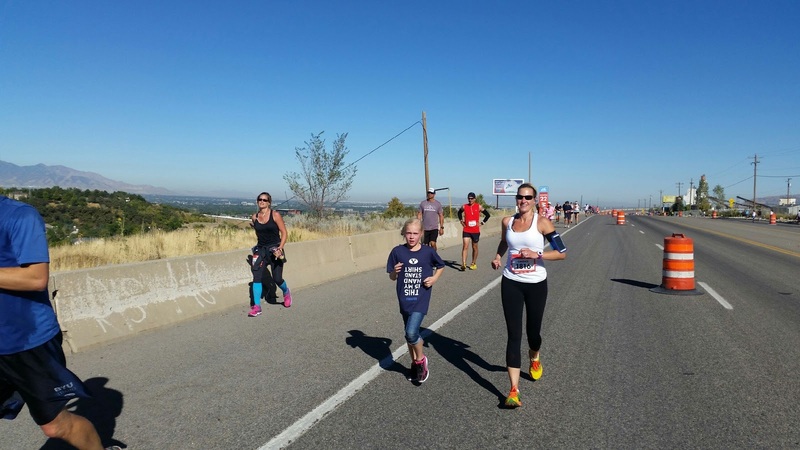 A mile or so before the finish, I saw Megan Dinsdale, which gave me the boost I needed to get to that finish line. If you ever have a friend like Megan, you are very lucky indeed. I literally pray in gratitude for her on the regular. She got me through that last mile and then darted off to the side as I headed into the finishing chute. Apparently my brain was working about as well as my body at that point and I didn't get any pictures of me with my family or with Megan. Double lame. I spent the rest of Saturday on the couch and my bed, and I was finally able to eat food without my stomach completely rebelling and cramping up on Tuesday. Well now that just made me tear up, which isn't easy to do. But the feeling is mutual and I am so lucky to have you in my life. You are an amazing friend and your determination and strength (in this marathon and in so many other areas) alwas inspires me. I am glad you are starting to feel better. I hope things are back to normal soon! Visited their stores in the sales day and I would say the it was one of the best shopping experience I ever had. The staff was good and moreover the products they had were brilliant with huge discount.